I've got two separate sheets we'll call 'Sheet A' and 'Sheet B' with a table on each. The table on 'Sheet A' has a Many-to-one relationship to the data on the second sheet. 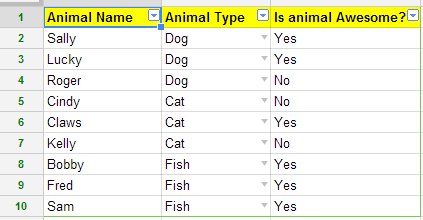 On the second sheet, I'd then like a summary of the data on 'Sheet A' which searches for all rows which match that particular record, then return a Yes/No response by using an 'AND' operator on each matching row. What I'm trying to automate is the second column of the second sheet (which I've coloured in green). in Animal Types B2, copied down. Another way of doing it, is by using the following formula.